At the Mann Center, with “La La Land” star Emma Stone on screen, the Chamber Orchestra of Philadelphia and a jazz combo accompany the hit movie. Near the end of La La Land, Ryan Gosling's character, Sebastian, part-time jazzman and full-time dreamboat, plays an unharmonized version of a simple piano tune. Without the chords to give it context, "Mia and Sebastian's Theme" might come across in a minor key. When it's given chords a few bars in, the melody gets reoriented in the mind's ear to major. It's as though this moment is telling the listener that, looked at a different way, life is actually a lot happier than it might first appear. Music is a legitimate star of La La Land ­— Emma Stone's eyes that go on for days are actually the star of the film — and nostalgia is another. The score by Justin Hurwitz works hard at authenticity but comes up only with a mix of jazzy styles, and is often bland. Songs sound like they are trying to remember other songs. Yet, screened Thursday night at the Mann Center to a live performance by a superb jazz combo embedded within the Chamber Orchestra of Philadelphia, the timing of the film's arrival just gets better and better. Never have we needed to escape more. Slipping in and out of reality, shifting from being thwarted to liberated in a single camera swoosh, La La Land unspools in velvet ribbons that float up and tie themselves in heart-shaped bows. You left the Mann Center — along with the more than 4,600 who attended — almost feeling that the long line of slow traffic afterward could have morphed into the movie's opening single shot of adrenaline that had drivers dancing on their hoods. If only. 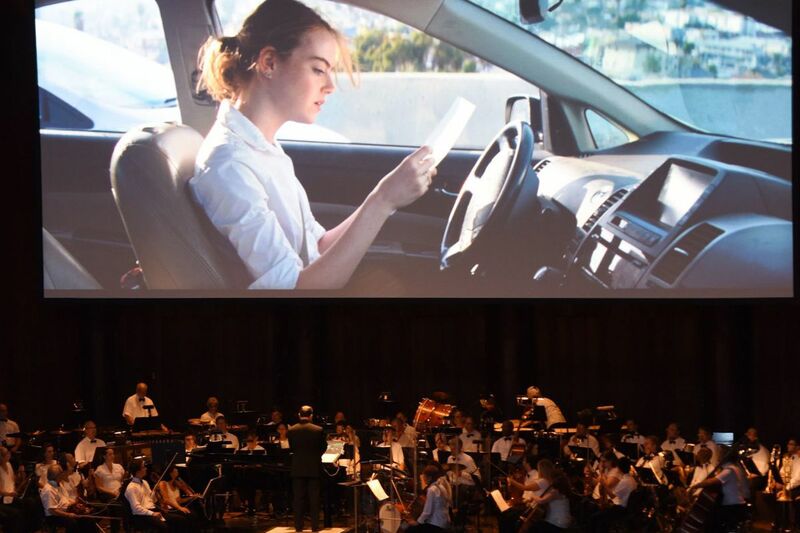 The Mann has made film-with-orchestra a major part of its artistic statement. Often it works. The Harry Potter tales grow only more subtle with live orchestra. Music and story here, however, sometimes worked at cross purposes. Sebastian has just put on a record when he and Mia (Stone) have their first fight. But the music we hear is actually being played by the ensemble on stage, and the problem, oddly, is that the musicians are good. So good that you want to listen, and you can't, because there's just too much competing for attention. The music that follows our lovers through the Griffith Observatory is sweet. Here, the orchestra is put to good use as the two dance around the Foucault Pendulum, the harp echoes the stars of the planetarium, and buoyant music lifts them into the celestial dust. The orchestra, led by George Stelluto, put in a strong performance — both individuals and the ensemble, and the jazz combo would have been worth hearing without the distraction of all those actors. Sebastian no doubt would have preferred it that way.